My wine of the Month for July is truly a rarity. 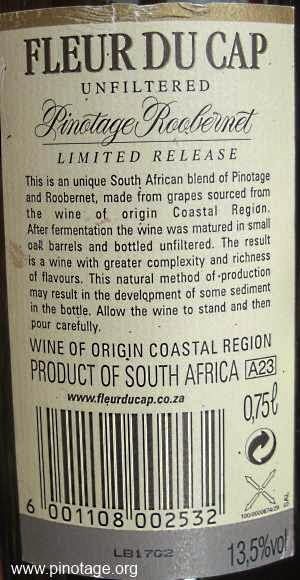 Indeed, it deserves the overused word ‘unique’, for it is a blend of two South African varieties, Pinotage and Roobernet. Roobernet doesn’t appear to have grabbed winemakers attention. This is the only bottle I have seen its name on, although I understand it has subsequently appeared in occasional blends but the only varietal I am aware of is a Cape Ruby port style Roobernet made by Jacques Smit. I expect, tho’, that it appears uncredited in some red wines as teinturer grapes make very deep red-black wines useful for adding colour to otherwise pale red wines. 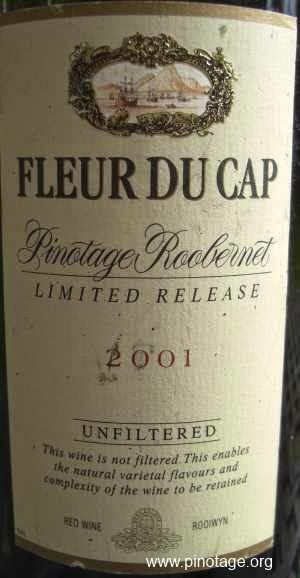 I bought this wine, the first and last, Pinotage Roobernet made by Fleur du Cap at their cellar shop at the Bergkelder in Stellenbosch, carried it back to the UK and kept it for a special occasion. A recent discussion about Pontac reminded me that I’d kept it long enough. I feared it may be passed its best, but I think at 13 years old I found it at its peak. I have no idea what Roobernet should taste like, but its 45% contribution seems to have given a solidity and base notes to the 55% Pinotage majority. This was a four square serious adult wine, full bodied with a sweet core to give lift (presumably from Pinotage) and an discrete spiciness. I greatly enjoyed it with dinner and if they make any more, I’ll be buying.